It's summer! It's hot, especially in China, which is seeing record heat waves. To cool off, some people eat chilled watermelon. A few kids are even wearing it. According to Xinhua, China's largest news agency, the trend started this past July in Wenzhou when photos of a small kid dressed in a watermelon suit (above) appeared online. The pics spread through China's microblogging service Sina Weibo and even ended up on the TV news. Other "watermelon suits" followed, including the one here. 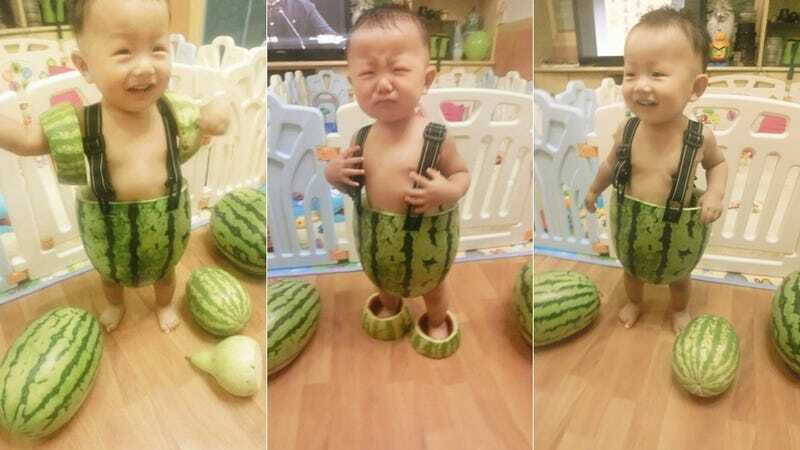 ShanghaiIst reports that this child's father spent hours making his child a melon outfit. There have also been variations on the watermelon suit, such as watermelon bikinis, hula skirt inspired melon outfits, and watermelon armour. Note that not all parents in China are dressing their kids in melon wear, and there isn't an army of watermelon children roaming the street. However, this does seem to be a thing. The text accompanying the above image read, "Watermelon Spartans are here!" Online in China, many people seem delighted by the watermelon suits, calling them both "creative" and "eco-friendly." Some even said that they thought the outfits could even cool down the kids. It's not a good idea to wear watermelon suits for long periods of time because the watermelon rind is moist and it could breed germs and bacteria. So, yeah, don't make a watermelon suit and then wear it for hours, or days, on end. Don't let your kids, either.